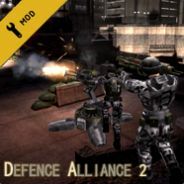 Defence Alliance is a mod franchise for Unreal Tournament, Red Orchestra and recently Killing Floor. Defence Alliance 2 features differant classes, such as the medic, rocketeer and mechanic. The main game mode is played with two teams, one attacking and one defending. There are differant objectives to accomplish, such as destroyables and touchables. New to Defence Alliance for KIlling Floor is co-op mode against specimens. The player has to survive the incoming waves of specimens. After a certain amount of killed specimens, the patriarch will spawn. When the patriarch has been killed, dead players can rejoin the match. In both these game modes, players can setup their own defences, such as various turrets, like a cannon, minigun or rocket turrets. And the player can build ammoboxes, so the team can refill their ammo when they ran out. - Fixed bullet hit sounds not working. - Fixed weapon bring up sound playing not loud enough . - Added missing weapon bring up sounds. - Added bloody bullet hit effect. - Footstep sounds are more clearly now. - Ammobox icon now also shows 90 degrees out of vision on the left and right sides. - Fixed stuck spot on Triumph (sandbags at tunnel area). - Preventing players from getting on top of the bunkers on Triumph2 (extra fall damage). - Fixed specimens not jumping properly over the wall on Triumph2. - Enabled zoom/ironsights with middlemouse. (setup your key bind). This is the build that I will forward to TWI, so let's wait and see what will happen. - Fixed being able to reload while reloading. - Fixed being able to throw a grenade while still in melee mode. - Fixed weapon getting stuck when doing combo reloading/meleeing then throwing a grenade. - Fixed being able to shooting while still reloading the LK2. - Fixed interrupting reloading on LK2, while on server the reloading continued. - Melee is alt-fire now, meaning right mouse button does melee. - Zooming/Ironsights is now middle mouse button (remove your da2user.ini). - You can now unzoom your weapon (sniper) at all times. - A gunner who is operating a turret will now stand besides the turret, though, he cannot be damaged individually. Since there is no discussion board available, do's anyone know if or how we can add extra maps to defence alliance 2? is it even possible? Does anyone know how to create a server with persistent stats? So is this mod dead? No update since 14 September and you can't get it from steam store since the play game button is broken. Only thing I managed to find outside steam was the beta 3 patch, not game itself. I'd be really sad if this mod turned out to have died, since It's a great and really fun to play!